UN refugee organization in Gaza expresses "deep alarm" at the loss of Palestinian terrorists' lives, ignores Israeli victims. UNRWA (United Nations Relief and Works Agency) released a statement on Monday that it is "deeply alarmed by the escalating violence and widespread loss of civilian life in the occupied Palestinian territory, including East Jerusalem, and in Israel." UNRWA, which purports to work to alleviate and solve the 67-year-old Palestinian refugee problem, says it seeks to "highlight [the] lack of hope amongst Palestinian youth" – without relating to the murderous terrorism in which this same youth has been engaged of late. The UNRWA statement decried the deaths of Palestinians over the past several days – deaths that occurred as the victims were taking part in violent anti-Israel incidents. It mentioned not a word about the four Israeli deaths and many Israeli wounded at the hands of rampant murderous Palestinian terrorism. Precisely as the UN agency was showing its enmity towards the Israeli side, it held a pledging conference at UN Headquarters in New York at which it raised no less than $100 million from a total of 22 different countries. Some $40 million was pledged to UNRWA by Sweden alone, and another $30 million by Italy and Belgium together. UNRWA claims to provide "educational, health, relief and social services for some 5 million Palestinian refugees in Jordan, Lebanon, Syria, the West Bank and Gaza." It deals only with Palestinian refugees – i.e., Arabs who lost their homes as a result of the 1948 War, including many who were encouraged to leave by other Arab countries. The other UN refugee organization, UNHCR, deals with all the other millions of refugees around the world. This means, unbeknownst to most, that an “Arab refugee” who moved to what became the State of Israel in 1946, left in 1948, and since then acquired American or other citizenship, is still listed on UNRWA books as a “refugee” – as are his children and grandchildren as well. He need have lived here for only two years to acquire these rights. UNHCR, which has helped "tens of millions of refugees," employs 9,300 people in 125 countries, one for every 2,850 refugees (assuming 25 million refugees). 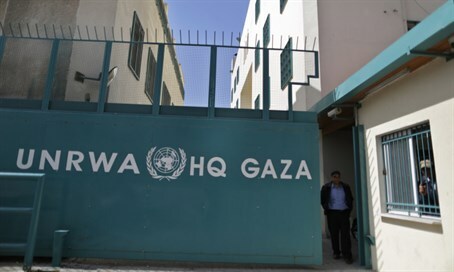 UNRWA, on the other hand, boasts that it is "one of the largest United Nations programmes, with over 30,000 personnel working across five areas of operations" – enabling one employee for every 167 refugees. As Mudar Zahran, Secretrary General of the Jordanian Coalition of Opposition. wrote in 2012, "UNRWA has been at the forefront of sustaining the Palestinians’ despicable status as refugees." The organization has come under fire recently for "disseminating crude, anti-Semitic caricatures on the Internet that incite to the murder of Jews," according to UN Watch, which monitors human rights abuses in the United Nations. Despite all the above, Mogens Lykketoft, President of the UN General Assembly, spoke at the pledging conference and thanked donor countries for their ongoing support of UNRWA. He stressed that “it is time to change the paradigm: UNRWA and the rest of the UN needs be strengthened and not weakened." Palestinians such as Mudar Zahran apparently do not agree.